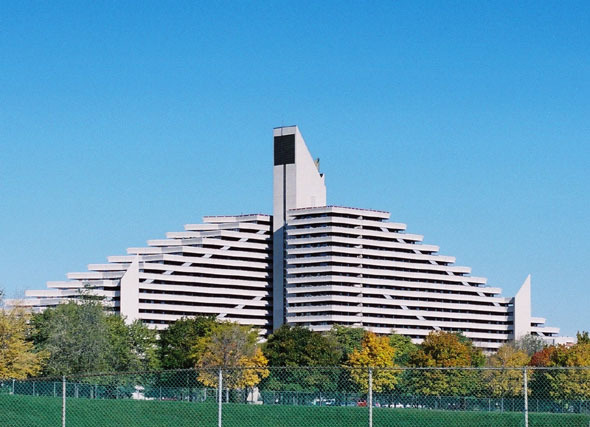 The Olympic Village is a twin-tower structure,built as the athletes’ residence for the 1976 Summer Olympics. It was built by Rene Lepine, president of the Montreal-based real estate company, Groupe Lepine. All the athletes were housed there, except those participating in equestrian sports and sailing, who were housed in residences set up in Bromont, Quebec and Kingston, Ontario. The Olympic Village was transformed into rental apartments following the Games. The rental office opened in January 1979. By 1980, all 981 apartments had been rented, and the Village had 2,000 residents.